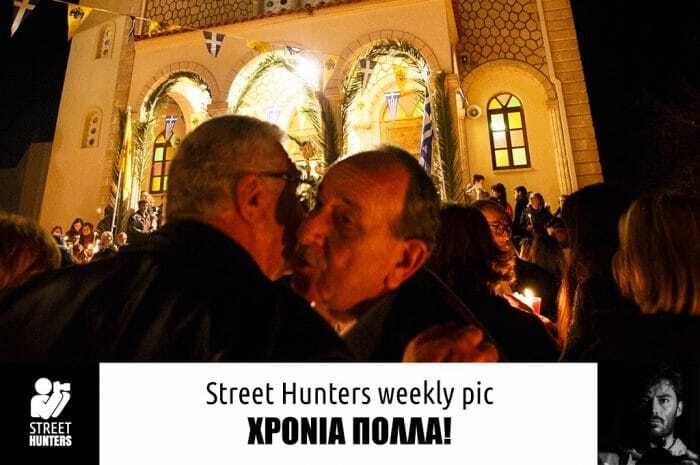 Home Weekly Street Hunters pic ΧΡΟΝΙΑ ΠΟΛΛΑ! Photo shot with 16-35 f/2.8 L lens on Canon 6D in Rethymno, Crete, Greece. When it’s my turn to choose one of my photos for Street Hunters Weekly Pic I always choose a photo I’m particularly proud of, and with an interesting back story. But this week I want to do something a little different, and share a photo with you because of what it means to me personally, and the emotions it conveys. You will probably have been bombarded of late by news of Greece’s economic and political woes, with photos of rallies, protests, and queues at ATMs. I’ve shot my own share of photos at ‘No’ Syriza rallies and ‘Yes’ rallies too, but it doesn’t seem right to share one here and now. This week I want to share a photo that epitomises the positive spirit of Greece, and the incredible qualities this country has to offer, and remind us all that the hard times now are just a period in the country’s rich and long history, and will eventually come to an end. I shot this photo during the night mass for Easter Sunday in Rethymno at the local church in the neighbourhood where I was living. This was my first ever experience of the Easter celebrations in Greece, and I’d been looking forward to seeing what a Greek easter was like as I knew all about the strong position the Greek Orthodox church holds in daily life throughout Greece, and I had only ever experienced the Catholic Easter Week in the UK. So for 2015 I got to see all the buildup to the Greek Orthodox Easter celebrations with Tsiknopempti and the Rethymno town carnival, as well as the solemn procession with the flower laden casket led by the priests on Good Friday. 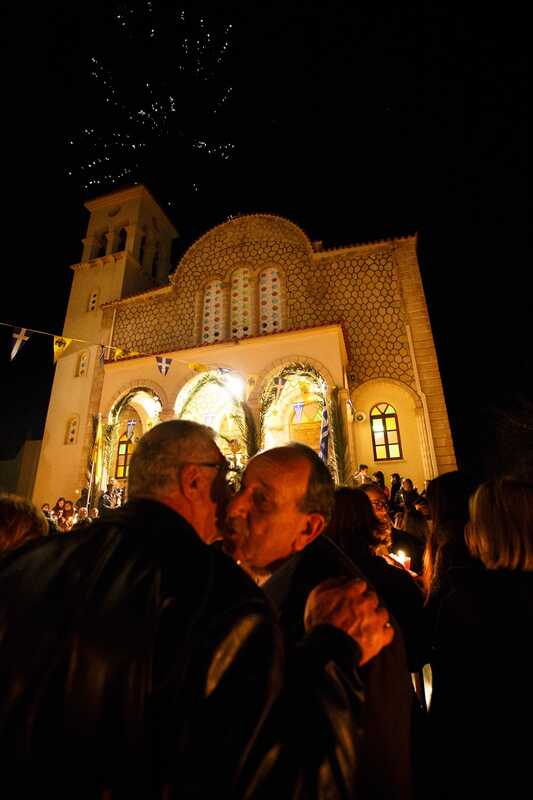 This photo shows the culmination of the celebration on the Saturday night after, when the Greek Orthodox church celebrates the resurrection of Jesus. People from all around the town gathered outside the church, with the priest addressing the people from the steps of the church. People bring candles to the celebration, and they are then lit and blessed with the ‘Holy Light’. The sight of a massed crowd of people all holding candles outside a lighted church is truly extraordinary, with fireworks and flares exploding all around. The atmosphere was so jovial that it felt more like being a triumphant football fan at the final whistle of a cup final than the religious ceremonies I was familiar with in Britain. At the climax of the celebration, everyone began to hug and kiss each other, saying ‘Χριστός Ανέστη’ (Christ has risen) and wishing one another ‘Χρόνια Πολλά’ (many happy years). Before I made this shot, I saw fireworks exploding over the church tower, and then these two men began to move in to embrace one another. I fired off a few frames as they moved closer with the brightly lit church in the background, and I couldn’t believe my luck as they kissed one another on the cheeks as the firework erupted above them! For me, this photo epitomises Greece. That’s not just because it shows the Orthodox Church, though undoubtedly it still forms one of the pillars of modern Greek society. This photo epitomises Greece for me because it shows a whole host of people coming together, and embracing one another (in this case literally) with warmth and affection. The joy, happiness and spirit of friendship on display here is symptomatic of how the Greeks treat not only one another but also outsiders, and perfectly represents how the people of this country will take you into their hearts and make you feel part of their society. I sincerely wish them all the best for the future.